Francois Chidaine is a name that crops up frequently on blog sites where folks know their Loire wines. David McDuff, of McDuff's Food & Wine Trail, visited Chidaine in 2004, and wrote up details of his trip this December. I felt like I knew some important things about their wine before I pulled the cork as a result of David's post: most of his grapes are grown biodynamically (though he doesn't make a fuss about it); Chidaine believes in terroir, and tries to produce wines that reflect that belief; and that the Chidaine business is run to highlight the grapes, rather than the talents of the winemaker. Despite this last philosophy, Chidaine is a rising star in the region. Deservedly so, in my limited opinion. We opened a bottle of the 2005 François Chidaine Montlouis-sur-Loire Clos du Breuil on Christmas Eve, and it was a special wine completely suited to a special dinner. (domaine 547, $20.99) This was all the more impressive given it's low price-point and its understated and elegant aromas and flavors. Glimmering straw in color, the wine had the aromas of early spring: citrus, apple, wet stone, and chamomile. These are aromas I associate with chenin blanc grapes, which is what goes into this Chidaine wine. The palate was elegant and steely, with soft apple, fresh-mown hay, and more stone in the flavors. Truly excellent QPR, and well worth going just .99 above $20. You could spend twice as much on a wine and not feel so satisfied. We had the wine with the Barefoot Contessa's rich seafood gratin. People with cardiovascular systems that are not in perfect condition may want to do as we did and substitute half and half for the cream--and milk would work, too. Flecked with saffron, filled with chunks of seafood and fish, and topped with a crisp crumb topping accented with tarragon, this was a meal that needed a wine that would cut through the richness with some acidity but not overwhelm the delicate shellfish. It was a very good pairing. 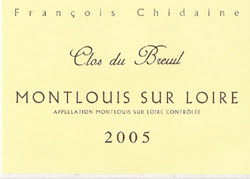 The 2005 Francois Chidaine Clos du Breuil was a beautifully made, beautifully balanced, and very pleasing wine. When I thought back on it the next morning, the image of an ice skater came to mind--elegant, balanced, but with a steely core that helps them slice across the ice in perfect figure eights. This is a case where I think my Chateau Petrogasm review for this wine expresses the wine more perfectly than words. That's how I'll always remember this wine, and the winter celebration that it paired with so well. And I'll most certainly be on the lookout for the other wine that Chidaine makes.